I’ve been baking bread. I haven’t been blogging it but, well, I haven’t been blogging. (Blame Scott Walker) So we’ll call this the omnibus “Bread so far” blog. You’ll recall that I laid out a project whereby I’d sorta cook my way through the Professional Pastry Chef, and that January got designated bread month. 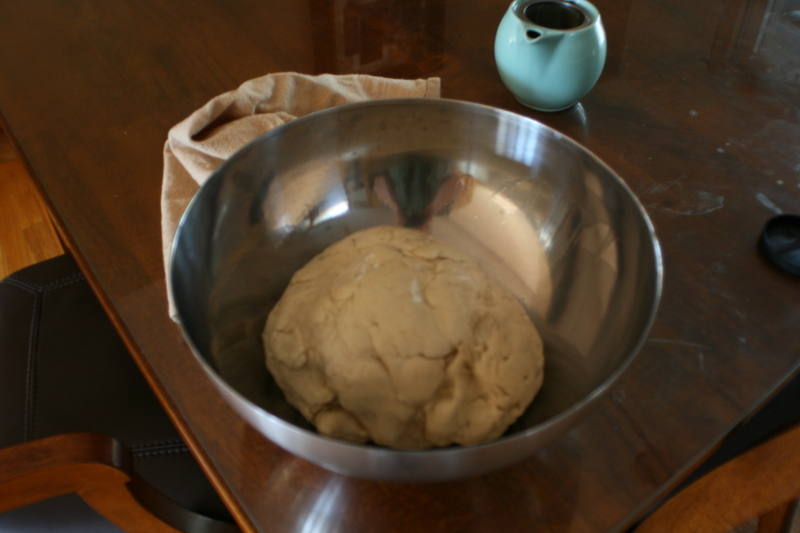 Technically I started early, because I woke up on December 31st with the overwhelming urge to play with yeast. I’m sure this happens to you all the time and you can sympathize. Never one to let a schedule keep me down, I went ahead and took a crack at baguettes. And I learned a few things. The biggest thing I learned was that I am not a professional pastry chef, but this book expects me to be. Twice the recipe had instructions along the lines of, “add x until dough is the right consistency,” without a description of what the right consistency might be. I’ve made bread before, so I made sure things were within parameters for bread dough, and hoped that was close enough get me a baguette. My result was definitely bread, and tasty. Also, definitely not a baguette. Lesson learned: In addition to reading the recipe ahead of time, read other recipes to make sure I know what various stages ought to look like. Who needs experience in the age of the internet? 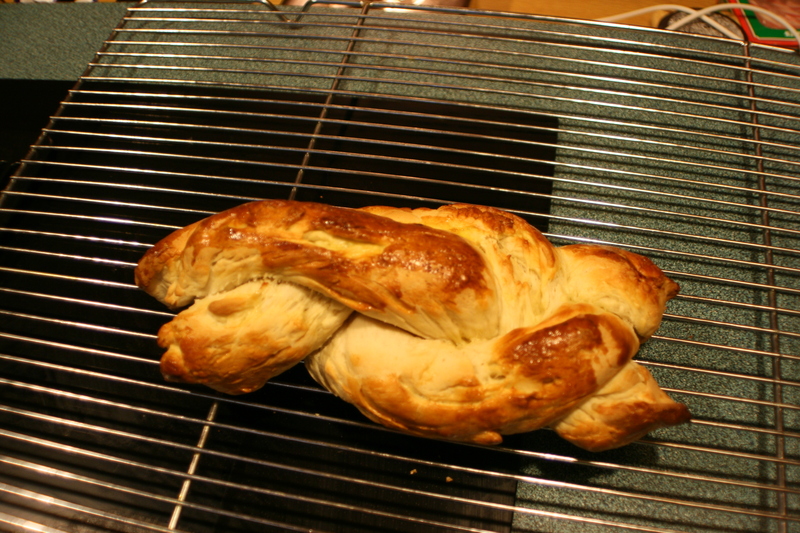 The next project was a loaf of braided white bread. This time I remembered to take pictures. I also paid enough attention to realize that the recipes were calling for cake yeast, and what I have is dried yeast. The internets rescued me with directions for substituting one kind of yeast for another, and I used my prior yeast proofing experience to shift the first steps into something that would actually make my yeast wake up and grow. 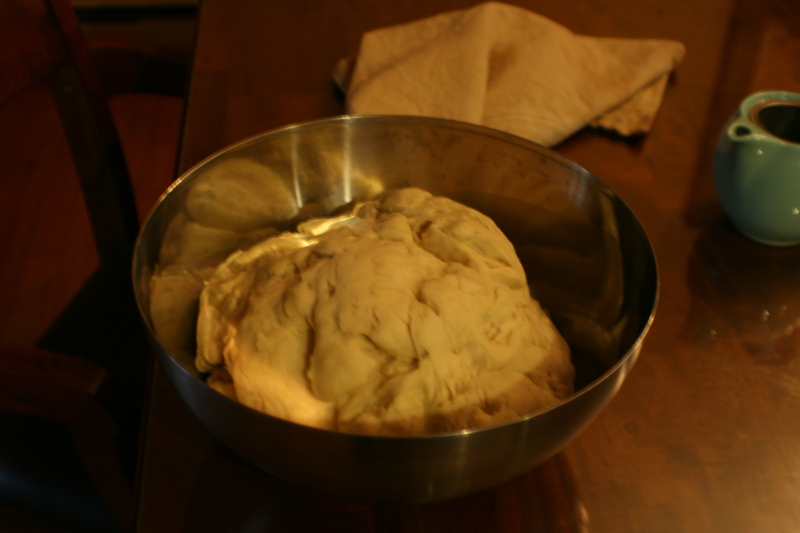 That’s what the dough for three loaves looked like when I was finished kneading it. Or rather, when my stand mixer was finished kneading it. I went down the hall to get some work done while my robot slave did the manual labor. And that’s what it looked like before I beat it down, broke its spirit, and bound it into ropes. Or something like that. 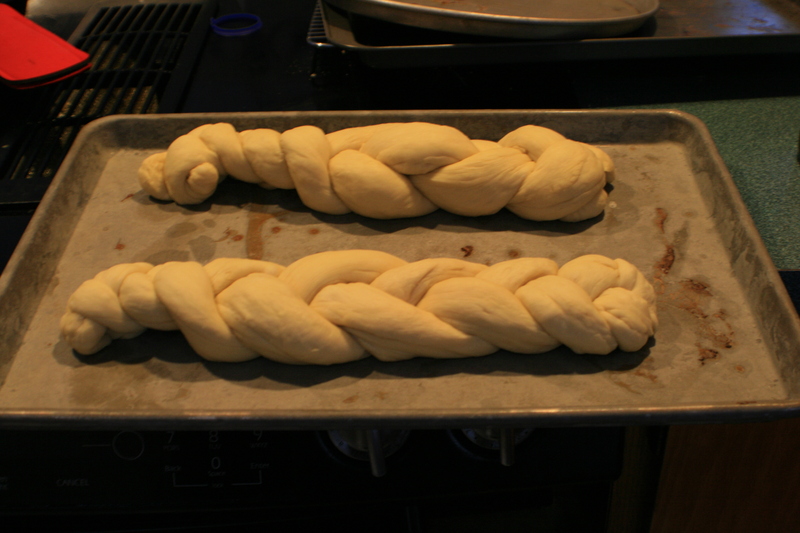 The cookbook has over two pages of instructions for how to turn the dough into braided loaves. It warns that you need to do the work quickly because the dough will keep rising as you work, and the longer it’s exposed, the higher the risk of drying out. But it doesn’t tell you much about the actual rolling out beyond “Divide into correct portions, roll between your hand and the counter.” Yay more learning opportunities! Lesson learned: Start the roll between your hands and roll until you’ve got something you can make lewd jokes with. Then when you start rolling on the counter, rolling back and forth isn’t enough – stretch the dough outward or you’ll be fruitlessly rolling forever. I did eventually get my first loaf rolled into ropes for a three-strand braid, meticulously measured to the recommended 12 inches. Yes, I keep a tape measure in my kitchen. And yes, those are beautiful, even ropes of bread dough. Shut up. After that it was time for braiding, egg washing, and the final rise. I only baked one of the loaves, putting the other two in the freezer for later baking. But I got tastiness! It’s not the prettiest and I could definitely use practice. 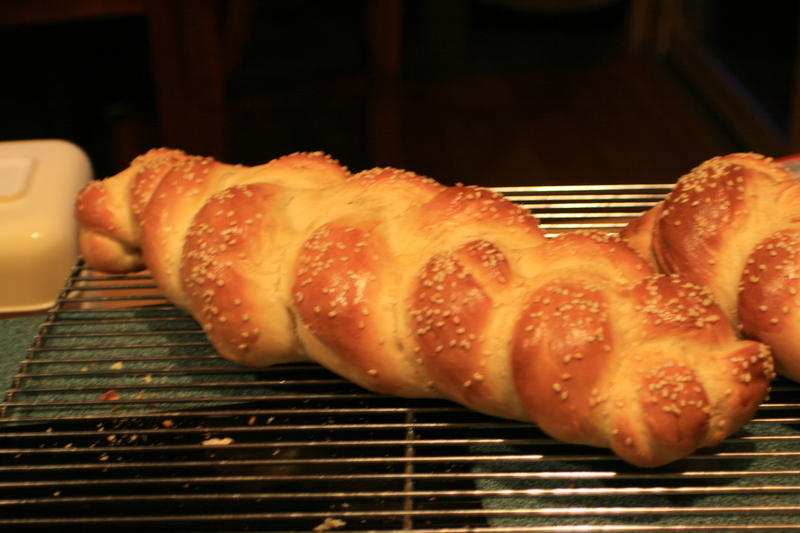 To that end, the next bread I made was challah. Two loaves this time, longer, and I didn’t bother to measure them. 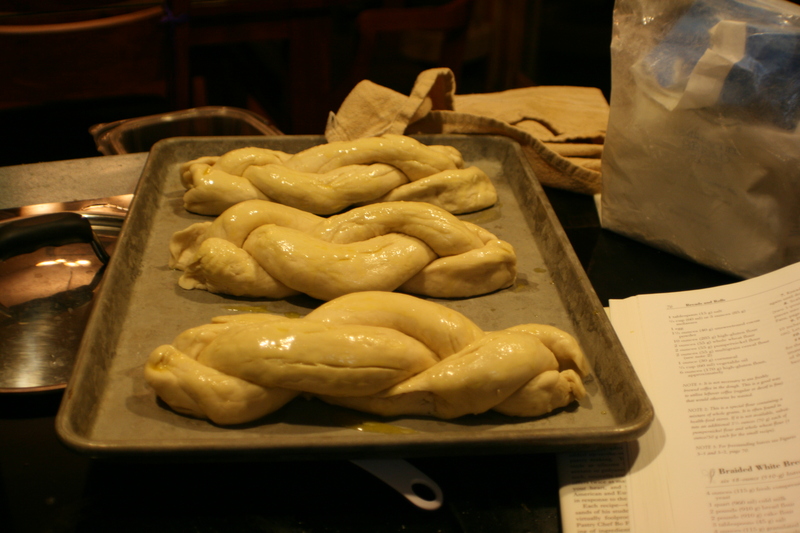 Can I state for the official record that I really like challah bread dough? It was easy to work, especially with the lessons learned from the white bread. I’d only gotten to the last rise and I’d already decided I would totally make this recipe again. Egg wash and sesame seeds on the loaves once they were finished rising, and then into the oven. These braids wound up working a lot better than the others. 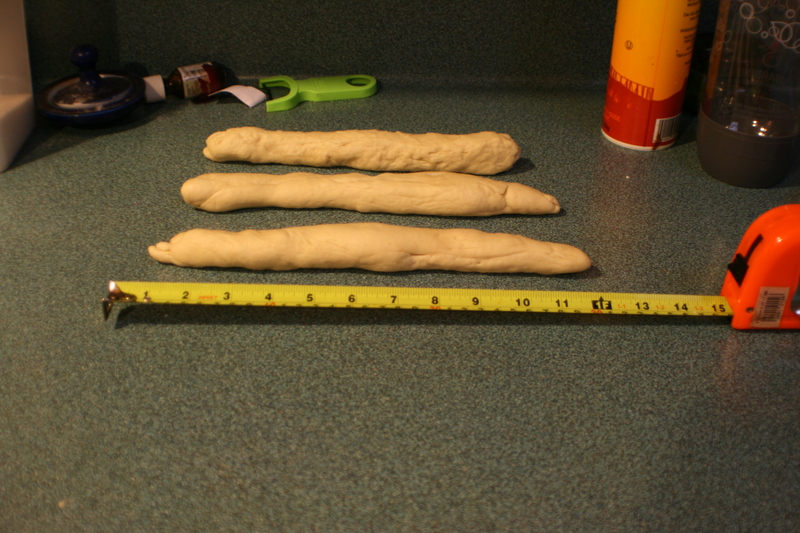 Part of that was that the dough was easier to work, and part of that was that these loaves were longer. This time I managed to tuck the ends under and the braids held their shape much better. That’s a loaf of bread to be proud of. And I’m proud. Fairly easy, very pretty, and tasty too. “How much butter is in this?” somebody asked at my recall-celebration-pot-luck I took one of the loaves to on Tuesday. “None,” I said. She didn’t believe me until I explained that the fatty rich flavor was from the egg yolks. Or maybe she didn’t believe me even then. Oh well. 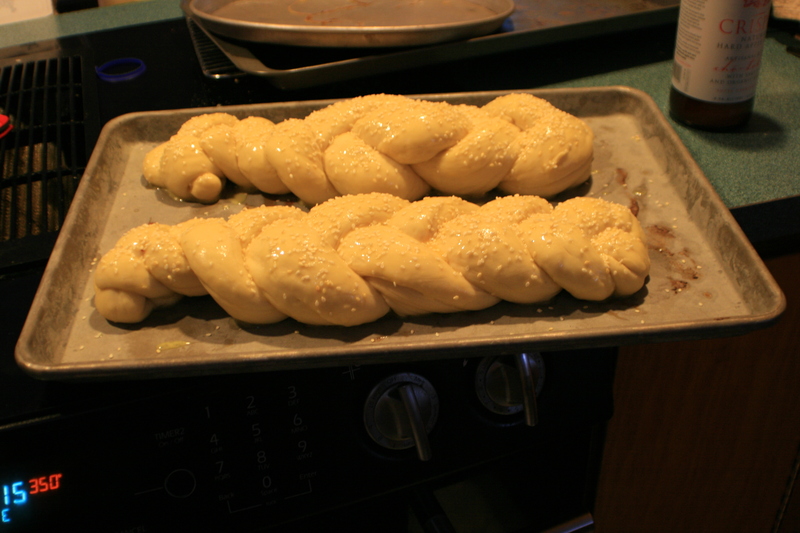 Lesson learned: Make challah again. Wow very pretty bread! I definitely want to try this!